In its final decision, the Australian Energy Regulator has not accepted APA Groups proposed rate of return and approach on depreciation for its regulated Victorian Transmission System. The revised tariffs take effect from 1 July. In its final decision, the Australian Energy Regulator (AER) has approved a 10.5 per cent increase in Multinet Gass total allowed revenue compared to the draft gas access arrangement review decision last September. There is also a 32.7 per cent increase in total allowed capital expenditure, a 17.3 per cent increase in total allowed operating expenditure, and a $30.5 million lower opening regulated asset base. A reset the majority of its interest rate hedge portfolio for 2013 17 means Multinet will benefit from significantly lower interest expense. Multinet was happy with the increase in its capital and operating expenditure allowances, but disappointed with the cost of equity allowance and Regulatory Asset Base calculation. The Australian Energy Regulators final decision on Envestras Victorian and Albury Access Arrangements for the 2013 to 2017 period will give the utility expected revenue $60 million higher than in the draft decision last September and $115 million higher than the revenue for the last five year period to 2012. Total revenue under the Victorian and Albury Access Arrangements is expected to be around $0.95 billion over the five year period. The capital expenditure can be increased to $560 if some construction milestones are met. Energy World Corporations Sengkang Power Plant in Indonesia is now able to produce 255 MW at full operation following its new 60 MW Siemens Gas Turbine achieving commercial operation on 8 March. The 60 MW expansion is the first phase of a 120 MW expansion with the second stage expected to be completed by September. Shares in Transpacific Industries reached a new one year high of $1.01 on 14 March. Aeris Environmental managing director Dr David Fisher is moving to a non executive director role from 29 March. The interim chief executive is chief financial officer and chief operating officer Peter Bush. The company said it will recruit a commercially focused chief executive to help accelerate its revenue streams and industry by industry rollout. Cardia Bioplastics has finalized two US deals. Designer and manufacturer of small kitchen appliances, Breville Group, is purchasing and marketing Cardia Bioplastics compostable juicer bags as part of its Juicer accessory offer to US consumers. And Custom Bioplastics has launched a Bio buddy dog waste bag using Cardias Biohybrid technology. Breville launched the 100 per cent compostable Clean & Green juicer pulp bag with its Juice Fountain range of juice extractors. The juicer bag and retail packaging is jointly branded. Cardia expects the agreement to generate strong sales. It said Breville is a leader in juicer sales, and has launched the compostable juicer bags in packs of 30 for sale both online and where Breville Juicers are sold. Brevilles aim is to encourage environmentally friendly waste disposal practices. Its USA Category Manager for Food Prep, Michelle Smith Aiken, said We recognized that consumers are always looking for even faster clean up when theyre using a juicer and that most were using their produce bags in their pulp bins to help with the clean up. We saw this as an unhealthy disposal of plastic and wanted to come up with a more environmentally responsible way. Custom Bioplastics (USA) is now manufacturing and marketing the newBio buddy dog waste bag it developed using Cardias Biohybrid technology. Custom Bioplastics is an established US manufacturer of blown and cast film plastic packaging, and is offering the Bio buddy dog waste bag as a lower carbon footprint alternative to conventional oil based dog waste bags. The number of dog waste bags used in the US each year is in the hundreds of millions, and governments and pet owners are said to be looking for a sustainable and renewable alternative to the conventional dog waste bag. Cardia Biohybrid technology requires less oil, and so has a lower carbon footprint. Custom Bioplastics also uses recycled plastics in the manufacturing process. Custom Bioplastics said the dog waste bag follows the new FTC Green Guidelines and laws being enacted in California. Ceramic Fuel Cells saw its share price more than double to 9.9 cents on news that German company Alliander AG would install up to 600 BlueGen systems across its grids by 2015, and that the state of North Rhine Westphalia has commenced paying between 45 and 65 per cent of the fundable purchase price of BlueGen units. The up to 600 BlueGen units are a first step in a strategic partnership between Ceramic Fuel Cells (CFCL) and distribution grid operator Alliander. Alliander will advance the decentralization of energy provision and introduce CFCLs fuel cell technology to the German market. It will initially focus on the Heinsberg region in North Rhine Westphalia before moving to the national level. Alliander plans to top up national and regional subsidy schemes to make the installation of BlueGen systems financially more attractive to clients. The state of North Rhine Westphalia (NRW), Germanys most populous state, has commenced implementing its recently announced mCHP subsidy policy, and authorities have approved the first application for financial assistance. The applicant, a local bakery, was granted 13,000 Euros for the purchase of a BlueGen, which is 65 per cent of the fundable investment costs. CFCL chief executive, Bob Kennett, said CFCLs first subsidized customer in NRW will halve his running electricity costs. Depending on the size of the business, the regional government will subsidize each generator between 45 and 65 per cent of its fundable purchase price. With this first approval, BlueGen generators are now part of the 250 million Euro CHP incentive program progress.nrw, which aims to increase the proportion of electricity generated by CHP plants to 25 per cent of the state's production by 2020. Green Invests Green Plumber/ Green Cities joint venture with Niagara Corporation Inc has received the initial instalment from American Water Inc for a pilot program for 1,500 installations that will provide for total installation and project fees of US$2 million. The projected completion date is 1 July. The contract is to install and retrofit plumbing product for low income customers of American Water initially in the California Service areas. Green Invests royalty varies in relation to product and the originating municipality, but is generally between 10 and 15 per cent of the final installation price. American Water is the largest publicly traded US water and wastewater utility, and provides drinking water, wastewater and related services to 15 million people in over 30 states and parts of Canada. Intermoco has launched its foreshadowed rights issue at 0.1 cent per share. The one for five offer is to raise $1 million. Po Valley Energy directors Graham Bradley, Michael Masterman, Kevin Eley, and Gregory Short participated in the companys recent private placement at 12 cents per share. Dart Energy directors Kirstin Ferguson and Sanjiv Misra have resigned. Chairman Nick Davies said We are sorry to lose Kirstin and Sanjiv from the Board of Dart. During their time with the Board their energy, enthusiasm and perspectives have added greatly to Board decisions. 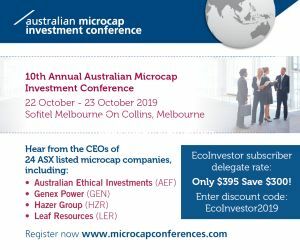 EnviroMission has issued 19,794,563 shares 3 cents each and 9,897,281 unlisted options with an exercise price of 5 cents and an expiry date of 15 September 2014. The deal is worth $593,836. Working capital is $100,000 and debt conversion $493,836. Geodynamics has produced an online introduction to its Savo Island Geothermal Power Project in Fiji. The Victorian Government has approved an extension to 30 September for the $25 million grant for Greenearth Energys Geelong Geothermal Power Project (GGPP). The funding was awarded in December 2009 but due to the financial environment it has not been utilized in the initial time frame. The grant comprises an initial $5 million that can be applied to the next stage, and the remaining $20 million to support the 12 MWe Demonstration Plant stage. Greenearth said it has been working with the public and private sectors and the University of Melbourne to advance the GGPP. It has adopted a plan to derisk the next stage of the project by increasing the focus on geosciences to address well productivity and deciding to drill a low cost exploration well to confirm the prognosis ahead of drilling more expensive production scale wells and building the demonstration plant. This de risked stage has been submitted in a funding application under the Federal Governments Emerging Renewables Program. Greenearth saw its December half sales revenue rise to $141,469 from $46,143 in the December 2011 half. The consolidated loss was $607,069, down from a $2,248,430 loss. KUTh Energy is undertaking a partially underwritten non renounceable rights issue to raise $863,500. The one for two offer is at 1.5 cents per share. The issue is partially underwritten by entities associated with the board and management to $148,572 in addition to their commitment to take up their full entitlement of $159,044. The funds are for working capital; site access works, the drilling of temperature holes and production well design costs for the project in Vanuatu; negotiating and signing a Power Purchase Agreement and land lease in Vanuatu; securing project funding for the Vanuatu development; securing exploration licenses now at the application stage; and maintaining existing tenements in Australia. Liquefied Natural Gas subsidiary Magnolia LNG, LLC has submitted project information to build, own, and operate an 8 million tonnes per annum LNG project in Louisiana under the Federal Energy Regulatory Commissions (FERC) mandatory pre filing procedures. Shares in Metgasco fell to an all time low of 6.6 cents on 13 March, the day the company announced it had suspended its key Clarence Moreton exploration and development program. Metgasco said it was a carefully considered decision brought about by the uncertain operating environment created by the NSW Governments announcement that it intends to change the regulations for coal seam gas operations. The company will reduce its organizational structure in line with its reduced operating activities, and resume operations when investment regulations are firmly established and it becomes prudent to invest shareholder capital in coal seam gas exploration and development. In the meantime, it will use its capital to pursue opportunities outside the Clarence Moreton Basin and broaden its technical, operations and geographical risks. Although the NSW Governments new regulations are still not finalized, they have created an environment of substantial uncertainty for energy companies and it is not clear exactly how they will affect the approval timing and conditions for new wells and developments, said managing director, Peter Henderson. With the NSW Chief Scientist report not due until mid year, Metgasco is potentially faced with another six months or more of regulatory uncertainty and delays, he said. The suspension, while very disappointing, is necessary to preserve shareholder value. A small company presence in the Northern Rivers region will manage community consultation and maintain key relationships. The company will rehabilitate most if not all wells and facilities on its permits, said Mr Henderson. Metgasco has been exploring for natural gas in Northern NSW for almost 10 years and was about to begin its development program to confirm well productivity and start gas sales to the local community. The company has spent nearly $100 million over that time. Metgasco has the largest uncontracted gas reserves on the east coast with resources estimated at 2,500 petajoules. NSW and the ACT currently consume about 130 petajoules of natural gas per year. It expects NSW gas supplies to tighten severely over the next few years, and along with other factors this has the potential to increase the value of its resource and encourage a more supportive political and regulatory environment. Kerry Parker has resigned as Panax Geothermals managing director and chief executive officer. No reason was given. He will remain on the board as a non executive director until 30 August to assist with a smooth transition. Mr Parker commenced with Panax in 2007, and was instrumental in assembling and managing its portfolio of geothermal opportunities in Indonesia. Chairman Athan Lekkas sincerely thanked Kerry for his contribution to Panax and to the geothermal sector in Australia and internationally.